Electric clothes dryers use 220 volts alternating current from the main electric panel. The electrical current is carried from the panel to the wall receptacle through insulated copper wires. A plug then connects the wall outlet to the dryer cord, which carries the current to the dryer. Dryer plugs come in either three-prong or four-prong configurations. 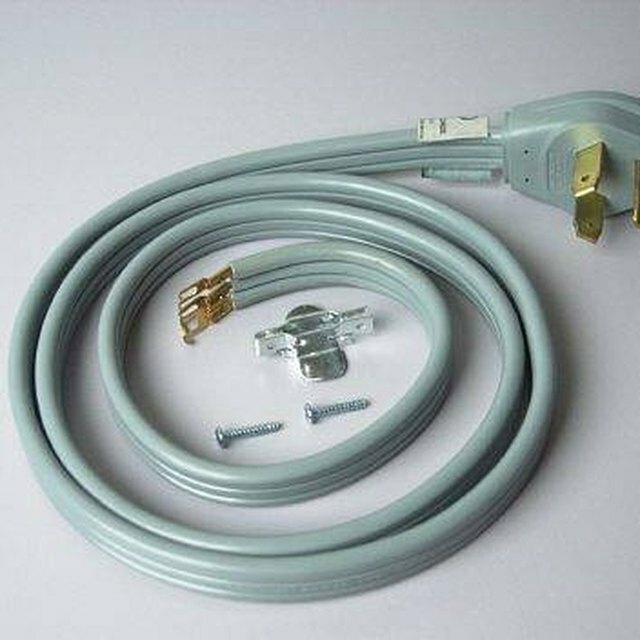 While there is an extra wire in the four-prong plug, the connection to the dryer's terminal strip is a straightforward process. Electric clothes dryer controls rely on proper electrical connections. Gain access to the rear of the dryer. Remove the metal cover from the dryer's electrical connection box. This is generally labeled by the manufacturer as "electrical connections." If no label exists, look for a small metal cover, typically 6 inches by 6 inches square. A cable connector will be installed in the cover or right next to it. Pull the cover from the rear dryer housing. Observe the screw terminals for the wire connections. There will be three screw terminals in a black plastic insulated housing. A fourth screw, green in color, will be attached to the metal frame of the dryer. Slide the end of the dryer cord through the cable clamp on the rear of the dryer or the metal cover. Leave the cable clamp loose. Attach the red and black wires on the cord to the two outermost screw terminals on the dryer. It does not matter which wire is connected to which screw terminal. Secure one wire to each screw terminal. Secure the white wire on the four-wire dryer cord to the center screw terminal on the dryer. Attach the green wire from the dryer cord to the green screw located on the metal frame of the dryer housing. Replace the metal cover on the rear of the dryer housing. Tighten the cord clamp. Follow all local electrical regulations when installing or servicing all electrical equipment. If you feel uncomfortable installing the four-wire dryer cord, contact a licensed electrician to perform the work for you.